I feel a little naive, but I never bothered researching what the climate of northern Baja is like in the winter. It's cold. Not cold like Minnesota, or even our home in East Tennessee. But when you're expecting to be wearing shorts and a t-shirt and it's in the forties (farenheit) at night, it can be a little jarring. So, in search of warmer weather, we're booking it south. 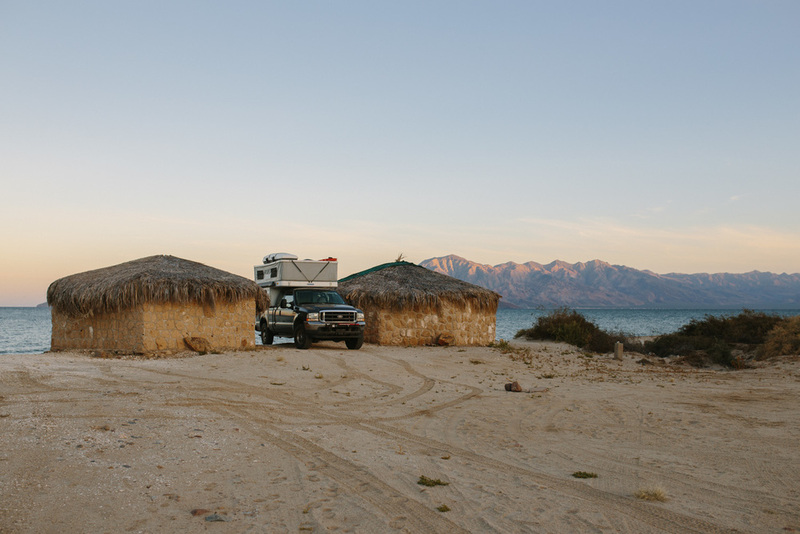 Bahia de Los Angeles (Bay of Angels) seemed like a likely spot to find some sunshine and warm water. While it was warmer than it had been farther north, it was still a bit cool and windy. However, it was such beautiful, seemingly endless empty beach we couldn't help but stay for a couple of nights. We stayed at Campo Archelon, which is run by a very friendly couple and has wonderful stone-walled palapas right on the water and has been the first place we've seen that recycles.